J D Neuhaus (JDN) will use the forthcoming LogiMAT exhibition (Stuttgart, Germany 14-16 March) to present visitors with examples from their extensive range of materials handling equipment. Among the highlights on stand 9C51 in hall 9 will be a light crane system, being shown for the first time, along with a Mini 250 hoist. A team of JDN experts will be on hand to discuss any specific questions from visitors regarding their materials handling requirements. Whether in a foundry, during liqueur production, or in the automotive or chemical industries, hoists, cranes and conveying system solutions from J D Neuhaus literally bear the load for all applications. With both pneumatic and hydraulic series lifting equipment together with crane systems, JDN covers a large number of tasks. Moreover, J D Neuhaus offers system solutions for many branches of craft as well as industry. 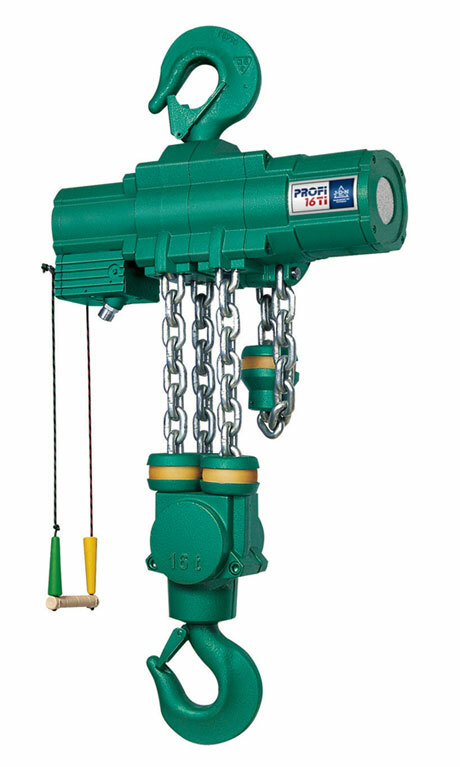 JDN places particular importance on the total cost of ownership (TCO), with JDN hoists and system solutions providing optimal versatility, lowest life cycle costs, shortest possible service times and maximum safety at the highest possible levels of efficiency. Their versatility is evident both in the standard series product range with comprehensive accessories, and in the special solutions designed specifically for the widest range of applications. Products with nickel-plated surfaces, for example, are available for the foodstuffs and drinks industries. Specialised hoists for use at temperatures down to minus 45°C or at water depths to 100 metres below sea level are also available. 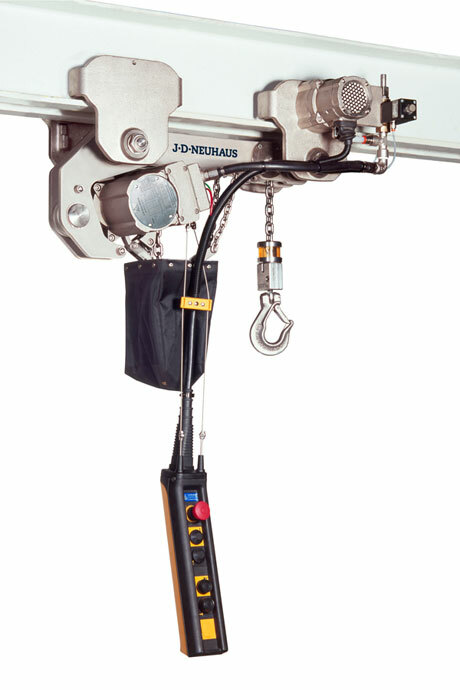 As the only manufacturer worldwide, J D Neuhaus supplies pneumatic hoists which can be swivelled through 30 degrees at both sides in the direction of travel as well as directly in the line of travel. 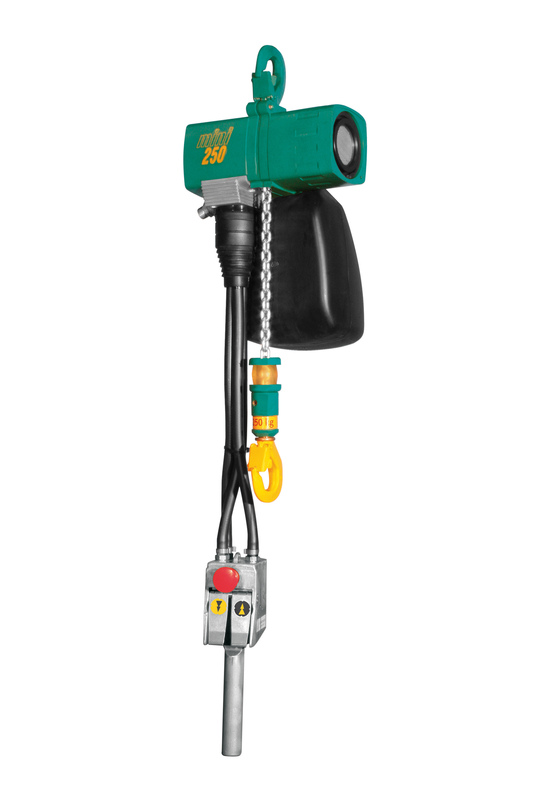 Also available are hoists with a carrying capacity of 25 tonnes that conform to a minimal headroom of only 470mm. Radio remote controls are also available for operating the products that are suitable for use in explosion-hazardous areas. A low maintenance requirement is the main contributing factor towards lowest life cycle costs of JDN products. The shortest possible service times also ensure a minimum of downtime while the "air consumption per metre lift" parameters illustrate how efficiently these pneumatic products operate. With regard to safety, JDN has, in response to country and industry-specific requirements, developed an additional anti-drop device for the Mini series air hoists, which is the subject of a patent application. In addition to the standard crane range, custom cranes are a speciality, whether for use on drilling rigs or for the performance of conveying tasks below deck. The extremely low headroom of these "under-deck cranes" is also exploited in industries where seagoing vessels have minimal room heights available. On cranes of this type, the load can be raised almost to the bottom edge of the girder on which the hoist travels. Light crane systems with pneumatic hoists are also new additions to the JDN product range. These provide individual solutions for almost any workshop and impress with their great robustness, smooth running and easy handling. JDN Service completes the range of offerings, from installation and commissioning of a system through to maintenance and general overhaul. To ensure optimal parts supply, the JDN team has also created spare-part and general-overhaul kits that make it significantly easier for customers to order spare parts. Training courses round off the JDN service offerings and the JDN Service is complemented by project and engineering facilities, which include the entire project management for client systems. If you would like to find out more about the products and services from J D Neuhaus, visit them in Hall 9, stand 9C51 at LogiMAT 2017. The JDN team would be pleased to provide you with information. 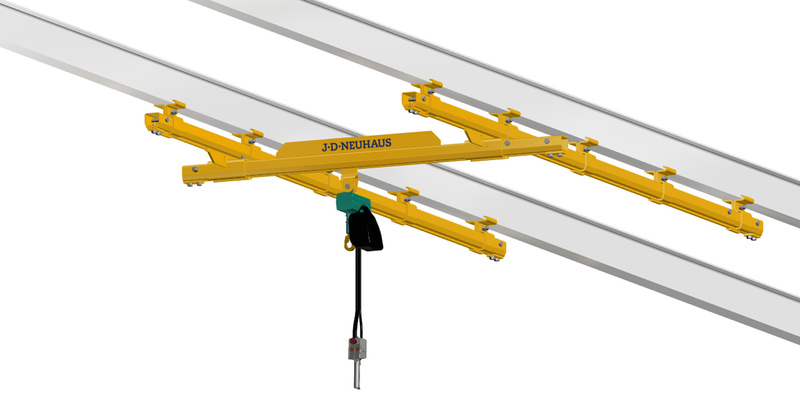 At its Witten plant, J D Neuhaus GmbH & Co. produces pneumatically and hydraulically-operated hoists and crane systems with over 200 employees across the group. Thanks to this globally unique specialisation, J D Neuhaus have not only set the quality standard, but are also the world market leader with customers in more than 90 countries around the globe. The products particularly set themselves apart in their resilient and reliable operation, thanks to their protection against explosions even in the most extreme operating conditions and capacities of up to 115 tonnes. For example, in oil and gas exploration in arctic temperatures as low as -45 °C; the undertaking of under water repairs on ships; as well as in mining and the chemical industry, together with heavy plant construction and in many areas of logistics. J D Neuhaus supplies around 70 branches in total worldwide. Production takes place exclusively at their Witten plant. The broad range of services provided includes equipment assembly, inspection, maintenance, and general overhaul, as well as running courses for customers. For distribution, JDN companies in France, Great Britain, Singapore and the USA have created a tight-knit global network, and in collaboration with international partners, have supported an export rate of over 80%. The founding of the company goes back to the year 1745, and it is now in its seventh generation of being family-run. At the Hebezeug-Museum (Hoist Museum) in Witten, one can see the history of this company as a living part of the business culture.